The condo is located in a gated community with lots of amenities. It is only 5 minute walk to the ocean. I believe it is the best strip of beach on the Grand Strand, and if you visit I am sure you will agree. It is very relaxing to sit on the large screened-in porch and enjoy the sea breeze. The condo is a short walk to main street North Myrtle beach, Walmarts and other nice shopping areas. It is a great family spot for a vacation in the sun. We now have wireless internet access. My wife and I truly enjoyed this particular beach condo: it's nicely decorated, comfortably furnished, and wonderfully located. The big screen TV in the living room and shaded/screened balcony were enjoyable when hanging out at the condo. Parking is easy; lots of spaces. We encountered no issues during our stay. Although the resort is close to Ocean Drive (OD), the beach, and grocery stores, I'd recommend use of a rented golf cart for these nearby trips. The posted photos and description are accurate; this is an absolutely fantastic place to stay: a real treasure! The owner is very helpful and friendly in all communications. I would highly recommend this condo for a pleasurable Myrtle Beach vacation. The unit is in a very large, gated complex, and as described, it was close to all the activities we enjoy. Several golf courses a few minutes drive away, beach, good restaurants and shopping close by. It is roomier than it looks in the photos, clean, with well-equipped kitchen, nice TV and wireless internet, and our cleaning deposit was mailed back in less than a week. We picked the worst weather week of the entire summer to visit, but were able to enjoy ourselves even just hanging out. We would definitely recommend the place to others. This property is in a good location. It is close to everything that you could possibly need. 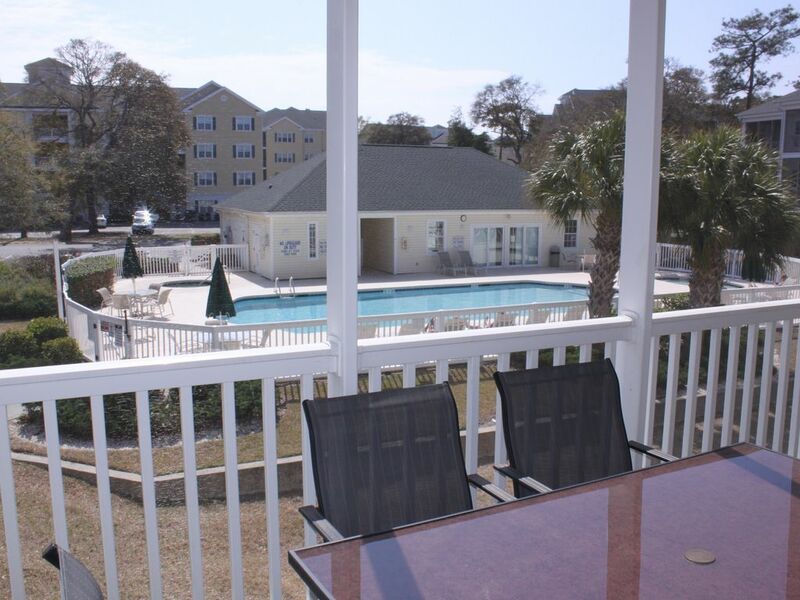 We have come to Myrtle Beach for many years and we find that this condo is centrally located to; the beach, Barefoot Landing, golfing, Calabash for shopping and fishing, many great restaurants, putt putt, and you can even walk to Walmart! Yet, it is a very quiet, secluded, gated community with security on site 24 hours. The condo is very clean, spacious, well decorated, great layout, with a screened in porch with a swing! The porch is perfectly angled as to where you have great shade and a good breeze! You can't help but enjoy this unit! Listing was just as described. Every amenity was there! We had such an enjoyable stay. Teenagers loved the game room and fitness center! The screened in porch was fabulous. Location was great...we will definately stay in this condo again!